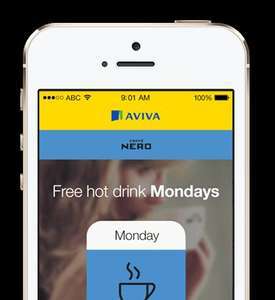 Download and register on the new MyAviva app to claim your free regular hot drink every Monday from Caffè Nero. Offer ends 31 December 2014 or when our 41,000 free hot drinks have been redeemed. Whichever comes first! Terms and conditions apply. This offer is only available to existing Aviva customers that download and register to use the MyAviva app. The bearer of the voucher code will be entitled to one regular hot drink: Expresso, Caffè Latte, Cappuccino, Americano, Standard Hot Chocolate, Luxury Hot Chocolate or Tea, every Monday for the duration of the offer whilst the MyAviva app is installed. Once the voucher code is revealed it can only be redeemed once on the same Monday that the code is provided. You will not be able to obtain another voucher code until the following Monday. The voucher code is available on a Monday from 00.00 until 23.30 and is valid for use subject to store opening times. If you do not redeem your voucher within this timeframe it will no longer be valid. The offer will close on 31 December 2014 or when 41,000 free hot drinks have been redeemed. Whichever is sooner. This offer cannot be used in conjunction with any other offer, voucher, or account card offer. This offer is valid at all participating UK Caffè Nero outlets. You will not receive a Caffè Nero loyalty card stamp when redeeming this voucher. This voucher is for personal and non-commercial use and is non-exchangeable, non-transferable, not for resale and not redeemable for cash. In the unlikely event that Caffè Nero becomes unavailable a suitable voucher of equal or higher value will be supplied instead. If you uninstall the MyAviva app you will no longer be able to claim the offer without reinstalling the app onto your device. If you decide to take up the Caffè Nero offer, you will form a contract directly with Caffè Nero. Aviva is not liable for the products and services of Caffè Nero. Thanks. Just picked up a hot drink on the way home. I'll be getting another on o2 prority tomorrow. "This offer is only available to existing Aviva customers"
Aren't these the swines who don't pay tax in the UK? If so, they are obviously trying to bribe customers. Support businesses who do pay taxes!! I wish I'd seen your post before going through the hassle of finding out for myself. Could someone put that in the title please? Aren't these the swines who don't pay tax in the UK?If so, they are … Aren't these the swines who don't pay tax in the UK?If so, they are obviously trying to bribe customers.Support businesses who do pay taxes!! Cafe Nero has a questionable record on that too. Who cares? Free coffee! hot. Who cares? You might when you find that the NHS isn't there for you when you need it - thanks to taxes supposed to be funding it not being paid by companies like Starbucks, Google, Boots etc.. Or when university tuition fees costs rise again for the same reason. Sigh. At least it doesn't involve the infamous tax evading Starbucks. General consensus is that Caffe Nero do the best coffee out of the 'chains',Costa = moderate,Starbucks = worse. Worth ordering an Espresso and giving it a go,or use o2 Priority Moments on Tuesdays if not with Aviva.